This time of year is crazy. I have relatives coming in from out of town and I’m trying to get things done from work to Christmas shopping before they arrive. Just the other day I spend six hours with the kids shopping for end of the year gifts for their teachers, friends and their dad, which required stopping at eight different stores to find everything we needed. Pile on running a couple more errands and hitting two grocery stores, I was exhausted but thankful I felt up to the task. After being in and out of the hospital this year, I’m glad I was able to do it by myself without my husband’s help. The kids were great organizing lists and helping carrying in groceries, of course, but I felt like Super Woman after completing all of our tasks! I do like shopping at stores where you can buy gifts as well as grocery shop, which is why Target is one of my favorites. Right now if you’re out doing your last minute holiday gift shopping at Target, stop by their grocery section to pick up Kraft products for holiday entertaining and cooking. Right now you can save up to $20 using coupons at Target on all kinds of Kraft products from Kraft Shredded Cheese to Gevalia Coffee. 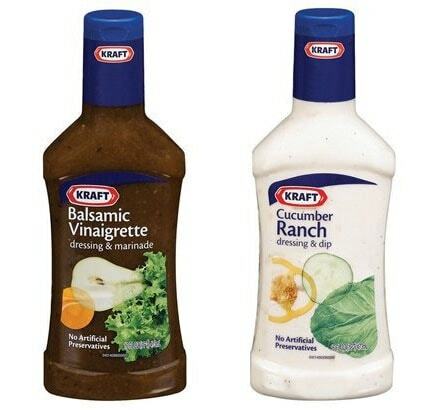 Inspired by Target’s Kraft sale, I picked up a couple of bottles of Kraft dressing. While I do make my own salad dressing most of the time, it’s nice to have a few bottles of Kraft dressing in the pantry, especially this time of the year when I don’t have fresh herbs from the garden. I picked up a bottle of Kraft Cucumber Ranch and Kraft Balsamic Vinaigrette along with some Brussels sprouts, apples, red onions, and dried cranberries since I wanted to make a slaw salad for dinner. When you’re busy with holiday shopping, cooking and entertaining, it’s hard to remember to eat healthfully. 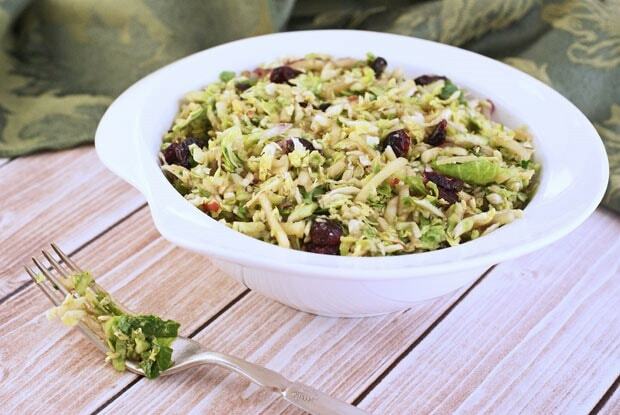 Salads like this Brussels Sprouts and Apple Slaw with Balsamic Vinaigrette are a great way to keep on track and fill up on healthy fruits and vegetables. It’s also a nice spin on slaw and a different way to serve up Brussels sprouts. If you know someone who says, “Ewwwww, Brussels sprouts!” don’t tell them it’s in the slaw until after they try it. They’ll just think it’s a crunchy, sweet slaw with cranberries. This salad takes no time at all to make if you have a food processor. Finally, if you’re serving up leftover turkey or ham sandwiches during the holidays, sneak in a layer of Brussels Sprout and Apple Slaw in your sandwich. It’s sort of like “pig pile Elvis style,” but much healthier! Using a food processor, shred the Brussels sprouts, apples and red onion. 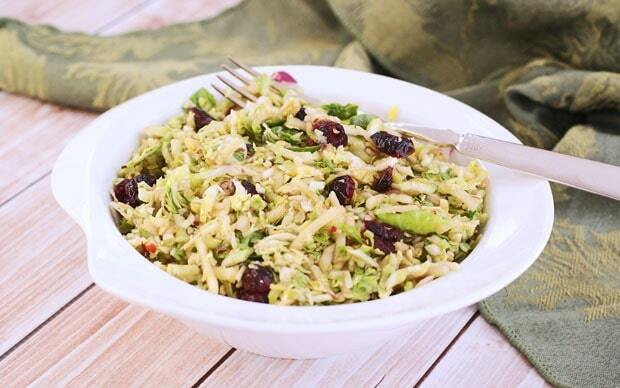 Place the shredded sprouts, apples and onion in a large bowl. Add the cranberries. Pour the vinaigrette over the slaw and toss to coat evenly. Posted in Gluten Free, Recipes, Veggies and tagged salad recipes on December 23, 2013 by Anne-Marie Nichols.